Hearty Beef Chili is made simple and utterly delicious with the help of the slow cooker. This slow cooker beef chili is full of chunks of tender beef, succulent mushrooms and enhanced with Gallo’s Pinot Noir. It’s a great make-ahead dinner that is perfect for your at-home tailgating party. Football season is officially upon us and in our house, that means fantasy football and relaxed Sunday afternoons at home. While I ‘technically’ have my own fantasy team, I tend to spend more time planning game day menus than checking my lineup. I would most likely get a lot more grief about this lack of effort in our league if I weren’t whipping up tailgate grub to keep everyone happy. What can I say? I go with my strengths. With our family’s busy schedule, we don’t actually do any ‘true’ tailgating because, honestly? I have no patience for that. I can, however, get on board with a classic tailgate spread in the comfort of my own home. Appetizers, wine and slippers? Yes, please! This week I decided to tackle (see what I did there?) one of my favorite football foods: beef chili. Adapting our favorite beef chili recipe to our slow cooker makes it even easier to make ahead and achieve that fabulous slow cooked flavor. 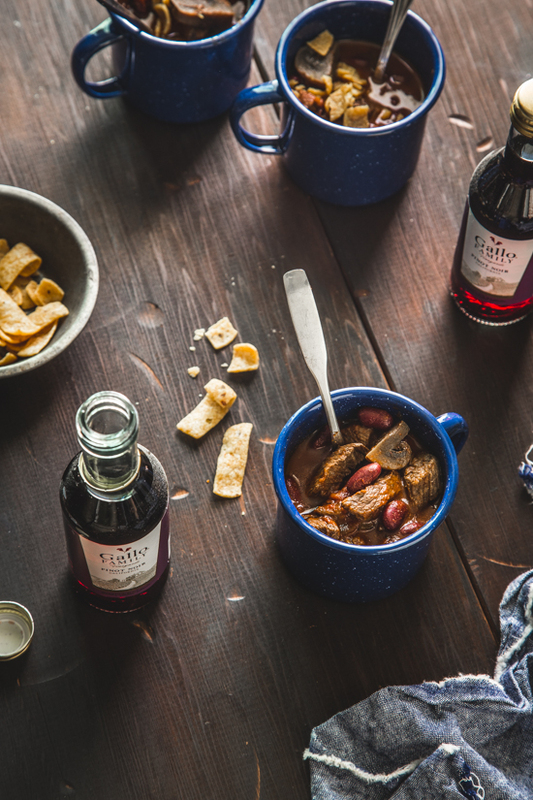 Now, my chili recipe might be far from classic, but it’s got everything my family loves: chunks of beef, plump mushrooms, beans and a splash of Gallo’s Pinot Noir. 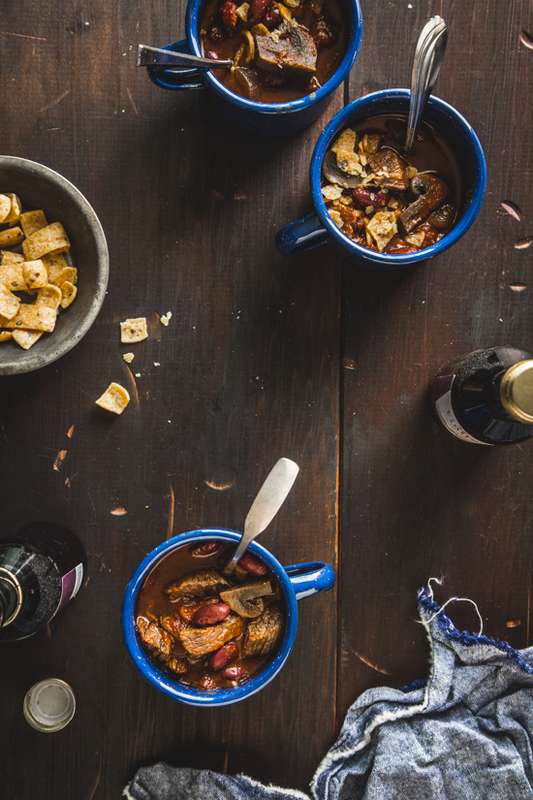 The Pinot Noir is a great pairing with the luscious beef and mushroom chili. Plus, it’s always been one of my husband’s favorite wines, so we tend to have it around quite a bit. 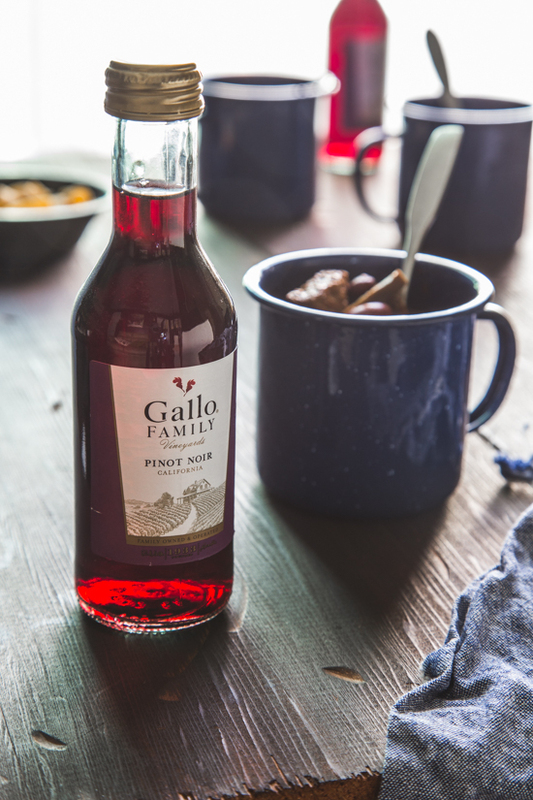 To make our at-home tailgating even more festive, I love having a variety of these Gallo Family Vineyard mini wine bottles on hand for the adults so that everyone can enjoy their own personal bottle of wine. Seriously, how adorable are these bottles? 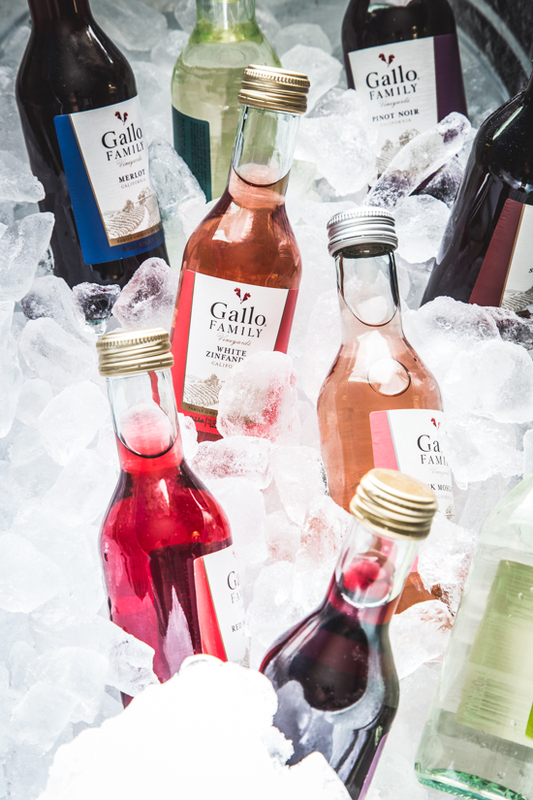 Gallo Family wine, especially these Gallo Family Vineyard mini wine bottles, make are the perfect pairings for tailgating menus. These mini bottles come in many varietals including Pinor Noir, Merlot, Pink Moscato and Chardonnay. It’s a great way to have a little something for everyone’s tastes – no matter what you’re serving! And for more BBQ and tailgating menu pairing inspiration, visit Gallo’s wine and BBQ pairing page. For more information on the Gallo Family of wines visit their website and store locator. There is even a $1 off digital coupon to use when stocking up for your next tailgating (at home!) party. Also be sure to follow Gallo on Facebook, Twitter, Instagram and YouTube for more tailgating inspiration. 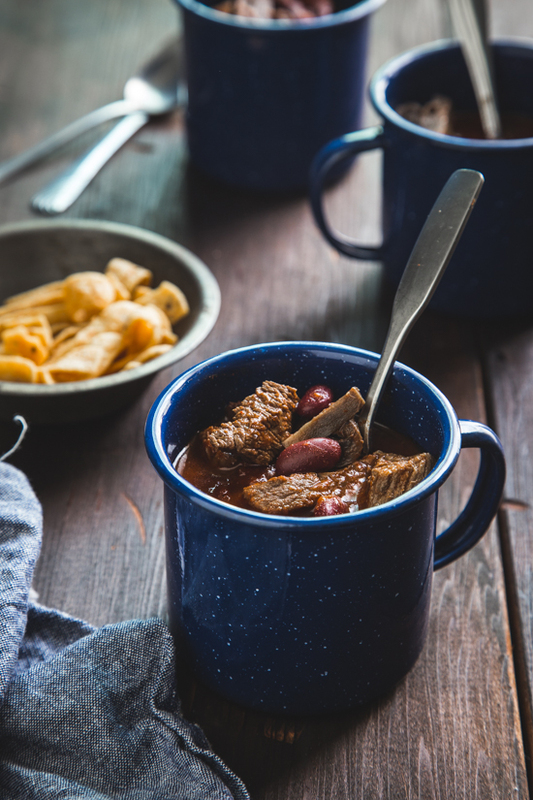 Here is the full Slow Cooker Beef Chili recipe, but be sure to keep scrolling to check out even more at-home tailgating dishes from our Sunday Supper Table! Set a large heavy bottomed pot over medium high heat and add olive oil. When olive oil is shimmering, add beef and brown on all sides. Work in batches if necessary. When beef is browned, but not cooked through, remove the beef and add it to your slow cooker. To the same heavy bottomed pot, add onions and garlic and stir for 1-2 minutes or until just softening. Add Gallo Pinot Noir and stir, deglazing the bottom of the pot. Pour mixture into the slow cooker, over the beef. To the slow cooker add the remaining ingredients. Stir, cover and cook on high for 4-6 hours. Slow Cooker Beef Chili can be made the day before your tailgating party and reheated the day of. Serve chili with sour cream and corn chips for garnish. Oh my that chili looks so beefy and good. I can almost taste the rich looking sauce? gravy? whatever you call it. A cup of this would not do. Give it to me in a big bowl. I love chili and what a great idea for tailgating,especially if your in the parking lot of the football game! I love it! 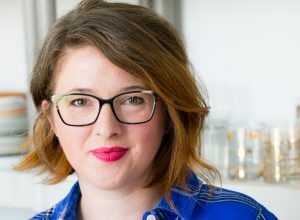 I am so with you that football is all about cooking for me. That and sitting with my laptop in my lap and pinning on pinterest! Ha ha. love these photos. So pretty. I just have to tell you how much I love that picture of the wine bottles on ice. It looks so pretty! It’s not football season without chili and this sounds delicious. Pinot noir is my favorite wine too and I bet it really deepens the flavor of this chili! This is a great idea for tailgating and your pics are stunning! This looks so darn hearty and delicious – my husband would be alllll over it during a cool day of at home tailgating! 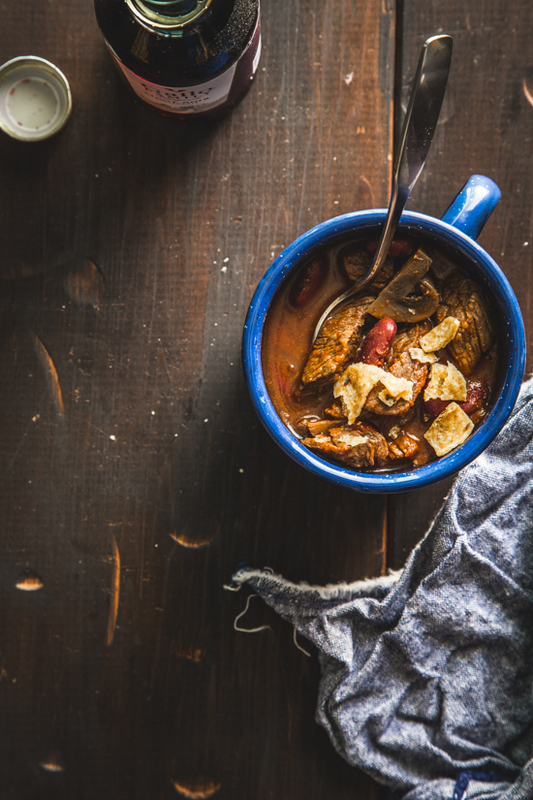 This is perfect for any cool Fall dinner! Nice and comforting! I am with you, I love the idea of food, wine, and slippers, to be comfy watching the game. This chili would be the only other thing I would need! I am all about this chili!